Hey Delhi-NCR peeps, let’s get to lettering! EARLY BIRD DISCOUNT ONLY FOR FIRST 5 REGISTRATIONS! HURRY BOOK YOUR SPOT NOW! In a hyper-digitized super-speedy world, calligraphy and hand lettering bring back a touch of personal and relaxation/reflection into your life and relationships. Without using any complex supplies, faux-calligraphy is the perfect method to use when working on non-paper surfaces like wood and enabling you to build a foundation for future adventures (gifts, cards, envelopes, endless possibilities). 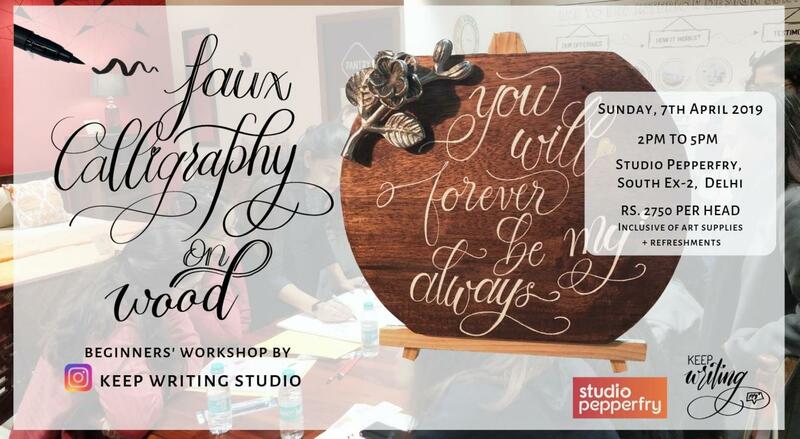 We will begin with basics of hand lettering, how to create faux-calligraphy and how to apply your new skills by designing your very own quote on a ready to frame wooden plank. Each participant will receive their own paint pen, a wood canvas, a workbook covering everything we learn as well as some practice sheets to take home. Your smile, and an open spirit to learn and make connections in community. All materials will be provided. Along with a wooden plank you would be able to apply faux-calligraphy to many other projects & surfaces (like chalkboards, canvas & large signs). Join us for a fun afternoon creating a beautiful decor for your home. To know more about the artist follow @keepwritingstudio on instagram.